Hyundai’s compact SUV is best known for its electric variant, the Kona Electric, which has a worthy claim to fame: it has the best real-world range of any electric car currently on sale (259 miles), and is far more affordable than most too. While the Kona Electric is worthy of its many plaudits, it will only account for a nominal amount of the Kona’s sales. The majority will go to its petrol line-up, which includes a three-cylinder turbocharged 1.0-litre and a four-cylinder 1.6-litre turbo. Finally, there is the Kona diesel. Plenty of rivals, such as the Seat Arona and Kia Stonic, also offer a diesel variant – but, nonetheless, there’s little demand for the fuel in the compact SUV segment. Most buyers use these cars for lower-mileage driving around town, where petrol (or electric) power suits, and diesel sales currently stand at around 10%. Hyundai maintains that diesel “is still an important part of our product line-up”. The powertrain in the Kona diesel is a newly developed turbocharged 1.6-litre four-cylinder unit. There are two options: one with 113bhp with a six-speed manual gearbox (driven here) and a 134bhp variant with a seven-speed automatic ’box. Our car's powertrain, which also delivers 207lb ft of torque, pulls nicely from low revs, responding eagerly from 1500rpm, and feels sparky on runs around town. Achieving 0-62mph in 10.7sec, it sits between the Kona’s two petrols for acceleration and is perfectly happy hitting motorway speeds. It more naturally cruises at 60mph rather than 70mph but doesn’t struggle to keep up with other vehicles. Probably the biggest criticism of the Kona diesel is how unrefined the diesel is. It’s noisy throughout its range and at low speeds, with a galling rattle that is hard to ignore. On this front, the Seat Arona diesel easily wins. This front-wheel-drive Kona (four-wheel drive is available on the higher-powered petrol), which uses a torsion beam set-up, is just on the right side of firm, but becomes easily unsettled on imperfect roads, and has a tendency to crash over speed bumps. Inside, the Kona is a little cramped in the rear for adults and boot space is less than in the Seat Arona. However, on both fronts it does beat its in-house rival, the Kia Stonic. The other let-down is the interior plastics, which are hard and scratchy to touch. Otherwise, the interior is well-designed, with good functionality throughout the infotainment system, particularly when interacting with Apple CarPlay. The diesel is only available from the mid-range SE trim and up, and we had the Premium SE, which gets everything but the kitchen sink. Included are heated and cooling seats, heated steering wheel, electric driver’s seat and rear parking camera. There’s also a host of safety systems, the most notable of which is the rear cross traffic alert and the lane-keep assist. The latter, which steers the car to keep it in lane, worked well during our test on the motorway. While certainly a decent car, the Kona diesel is the weakest link of the three-strong family. We’d go for a petrol variant over the diesel - unless you’re a particularly high-mileage driver - or even the EV if your lifestyle allows. There’s a near-£3000 premium for the diesel over the equivalent turbo 1.0-litre Kona petrol, which would take a lot of miles to claw back. 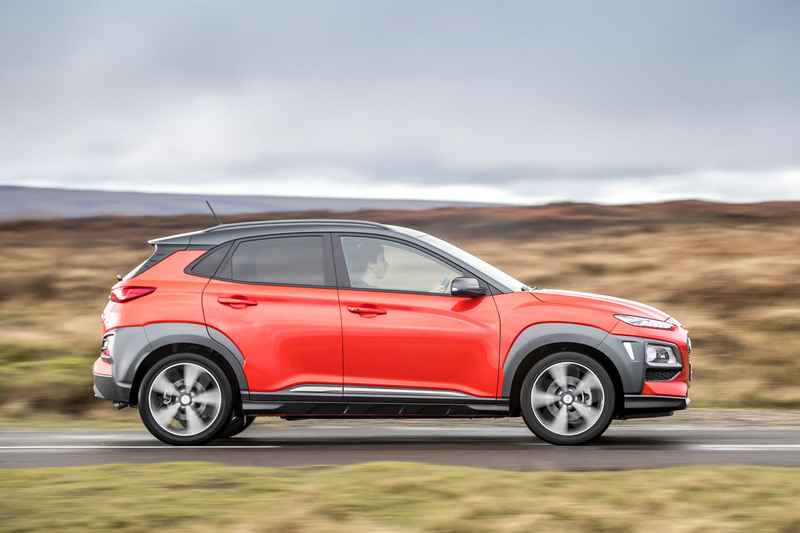 As a range, Hyundai should be commended for the Kona’s strength in the handling department and for its bold styling, both of which make it stand out in an largely humdrum segment. All in all, the Seat Arona beats the Kona to the best all-rounder gong, but Hyundai’s offering has plenty to tempt buyers considering a compact SUV. The best all rounder? That's one of the stupidest things I've read on the internet! Yeah, we should be supporting VAG!! !